Agile has become the new buzzword in marketing circles, and for good reason. Agile provides marketing professionals with increased efficiency and transparency across the board. Effectively optimising delivery to your clients and increasing your agency’s productivity. At Infoware Studios, we are passionately agile. It is a common theme in all that we do in the company, within every department. Even our marketing team runs on the agile methodology. And what a difference it makes! We believe that the benefits of the Agile methodology can be applied to many different types of industries, not only the software development field. Because at its core, agile is about improving transparency, working more effectively, increasing productivity, improving flexibility, managing work flows and optimising delivery to clients. And we believe this fits in perfectly with marketing goals. 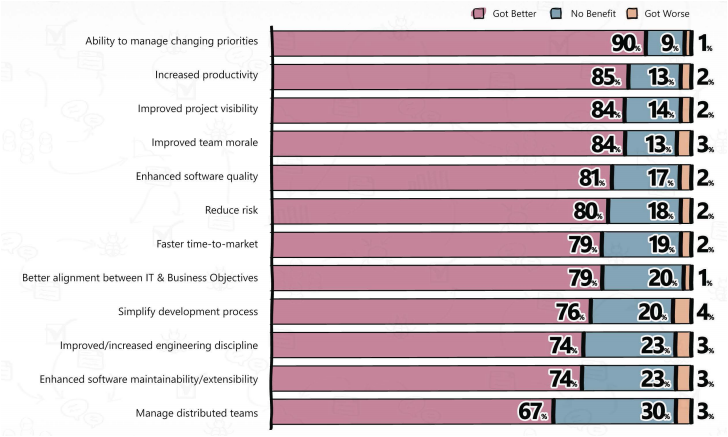 So for example, 85% of respondents experienced an increase in productivity when adopting the agile methodology, and 84% had an increase in project visibility. Compared to the traditional way of doing things, the respondents who used agile in their projects enjoyed a 42% success rate, with only 9% failing, compared to a 14% success rate with traditional approaches. Work is broken into short iterations, increasing speed of delivery and responsiveness to the market. Sound like a great solution? Keen to keep up with the times and go agile? Speak to us to find out why there is such a hype around adopting agile in a marketing environment.